I wrote this post over the course of a couple of hours on Day 2 of the LA Auto Show on Thursday, posted it and deleted it. I have since decided what the hell and have put it back up (with a few edits). 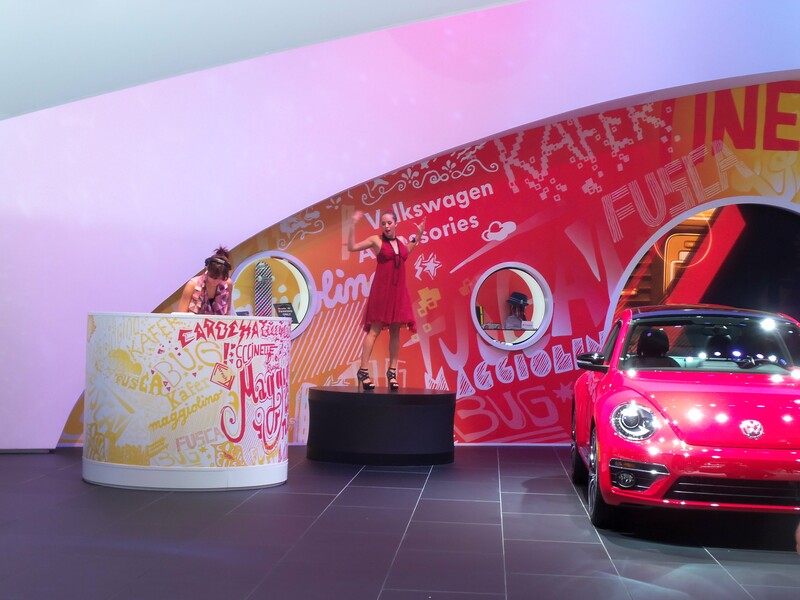 A musical homage to the 1960s at Volkswagen on Day 2 of the LA Auto Show. That’s not a problem on Day One of the Auto Show, which is so packed with automotive press conferences in both exhibit halls that many of the manufacturers serve a breakfast of their own, complete with baristas and cappuccino servers. So I poked into the South Hall, where the first press conference of the day was being held, and searched for a little caffeine. But the hall looks very different on the second day of the Auto Show. The chairs setup for press are gone and the exhibits are rearranged into the form they will take tomorrow, when the show officially opens to the public. I moseyed over to the auto makers most likely to provide goodies for their customers: the luxury brands, like Lexus and Mercedes. Nada. I finally found breakfast being served at BMW, but that was only for invited guests. There wasn’t much else to do but head over to Mazda, whose conference was my reason to be here on Day Two at this time in the first place. And I’m glad I did; they were the sole automaker to bring their barista to the floor a second day. As the conference began, it was apparent that they were not going to be unveiling anything that fit easily into my assigned topics of cars moms would love and green vehicles. So I wandered around the hall again, taking photos of models that I might actually write about – as well as cars I just loved. And that’s when I felt my phone vibrate in my bag. It was my husband. And so begins the guilt. I explained that I am wearing women’s business clothes (instead of my usual jeans) and they have NO POCKETS so the phone is in my bag and unless I’ve got it pressed right to me, I don’t feel it vibrate. I compensate by holding I on my lap every time I am seated, but I was busy taking photos on the floor. Perhaps this is the best reason to finally upgrade my old Blackberry for a modern smartphone that takes decent photos? Anyway. I told him I would leave earlier than I had planned to be with her. He said no, he could work from home today. He noted that she does, after all, have two parents. I reminded him that for 16 years, I have always been quick to answer a call from the school. “Except when you don’t,” he said. I don’t think that’s fair. I don’t like to talk when I’m driving, even with a Bluetooth device – I find it too distracting. So not answering when I’m in the car is NOT a bad thing. And I don’t answer right away when I’m talking to someone else. That is just common courtesy. Nor do I always remember to take my phone with me when I run into the kitchen for something. I remember a time when people did not expect you to be available 24/7 (I am not talking about family now, but in a broader sense: employers, clients, others who send an email and want an answer right away). There are times I wish I did not have this wonderful mobile technology which has enabled me to do amazing things no matter where I am (like write this from the floor of the LA Auto Show) but are kind of a double-edged tether. ADDENDUM: Our poor daughter made it as far as first period at school that day before wisely going to the school nurse. It took my husband an hour to get from his office to the school to bring her home, and once he had her, he had to stop the car to allow her to be sick. Yes, she has two parents. But for most of her life, when she’s been ill, I’m the one who has taken care of her. And this did not feel right. I had one more press conference to attend that morning. I thought about leaving, but decided to stay. It turned out to be the one event of Day 2 that generated some actual news that was relevant to the green car assignment: an announcement by Mitsubishi that they were partnering with USC’s School of Engineering to build a working smart grid infrastructure. As such, the automaker is donating 12 i-MiEV electric mini-cars and charging stations that will be placed around the campus. The conference also had some of the best visuals, as a unit of the USC Marching Band and a couple of cheerleaders paraded around a little i-MiEV. I should have gotten some great photos, but I was too upset to focus. Even though my husband assured me he was home and our kid was taken care of, I left the press conference while the band was playing “Tusk” and hurried home, because that’s where I felt I needed to be. Does motherhood necessarily mean always feeling guilty when something goes awry? For me, I guess it does.